Most visitors to Bohol stay in nearby Panglao which has some beautiful beaches. In addition, it’s possible to stay in Cebu and visit on a day trip. Another possibility which would be to stay in Carmen. Carmen is located next to the Chocolate Hills, perfect for those who wish to photograph them at different hours throughout the day. 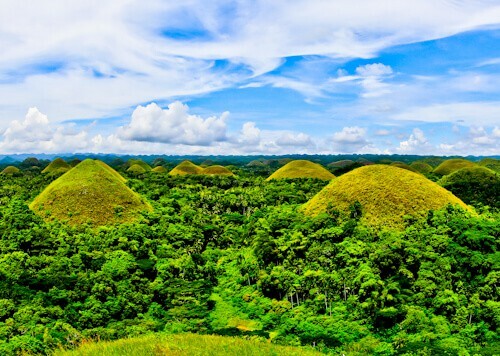 The Chocolate Hills are the major tourist attraction of Bohol. In fact, these are often the main reason people visit the island. During the dry season the hills turn brown and resemble the famous Hershey’s Chocolate Kisses. For this reason, they were named the Chocolate Hills. There are over 1200 Chocolate Hills, so photographers have many different options to shoot them from. Carmen is the place to stay if you wish to photograph the Chocolate Hills early morning through to late evening. In addition there’s also an ATV route through the hills, for those who enjoy an adrenaline rush. Furthermore, in the next few years the Chocolate Hills may become a UNESCO world heritage site. The Tarsier is a primate which can only be found in the Southern Philippine Islands as well as parts of Malaysia and Indonesia. Due to its habitat you’re only realistic chance of seeing one is in Bohol. It’s an endangered species therefore in Bohol they have opened a Tarsier research and conservation facility. As a way to raise awareness of the Tarsier as well as fund their conservation, you can visit and see the Tarsier in their natural habitat. 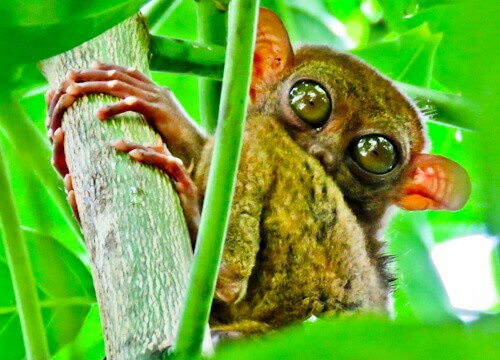 Read about my experience and how to photograph the Tarsier. To photograph the falls I recommend you take a filter so you can make a superb daytime long exposure. 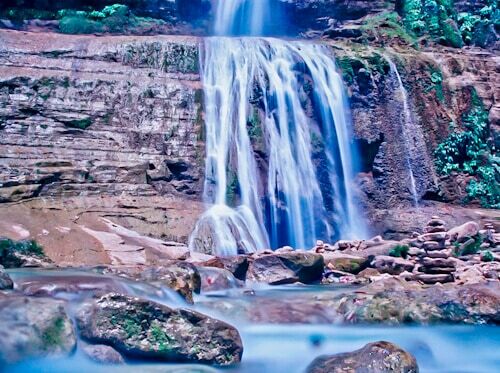 Philippine photographer Dennis Balaga made an excellent long exposure of the Can Umantad Falls (above). Located in Eastern Bohol is the municipality of Anda. In this area of Bohol you’ll find several resorts, hotels and some of the best beaches on the island. 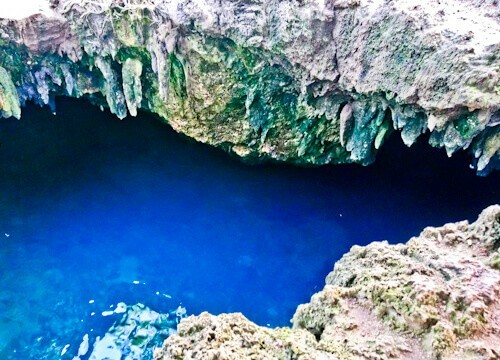 A unique place to visit in Anda is Cabagnow cave pool. It’s an open cave therefore you can jump in and enjoy a swim. Additionally, you can visit the nearby Combento Cave where you can also go for a swim. The man made forest is a series of huge mahogany trees. These trees have been planted in sequence ensuring symmetry. 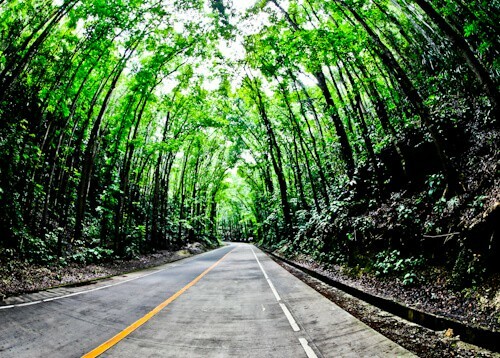 There is a 2 km stretch of road outside Loboc which runs through the forest. Due to the trees providing shade to the road, this area is considerably cooler than the rest of the island. Additionally, this is probably the most Instagram worthy road on the island! For this reason you’ll see crowds of tourists taking photos along this 2 km stretch of road. 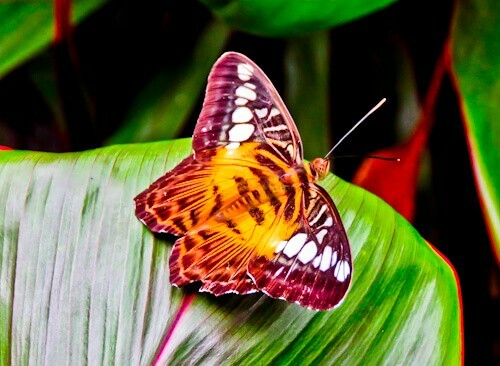 On the route from the Tarsier Sanctuary to the Chocolate Hills you’ll pass a Butterfly Farm. If you wish to see several different types of butterflies I recommend you stop here. In addition, there’s information on the life of a butterfly as well as a fairly priced cafe. In the butterfly enclosure there are hundreds of different colored butterflies. These butterflies are extremely easy to photograph and will probably even land on your body as well as your head. For this reason it makes a good stop for Instagram photos! The Loboc river runs through the jungles of Bohol. There are regular river cruises which offer buffet lunch as well as live music, not to mention the beautiful views. On this 2 hour trip you can enjoy Philippine and international food. In addition there is a traditional live band and dancers. It’s hard to appreciate the views with all the food and music but there are some wonderful photo opportunities and if you’re lucky some wildlife. 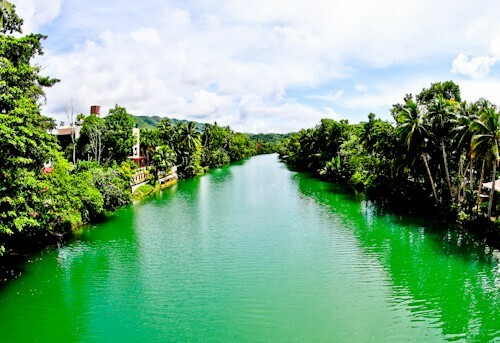 For those who like reflection photography, you’ll be happy on the Loboc river which offers reflection shots with a green tinge. As well as lot of jungles, rivers, wildlife and of course the Chocolate Hills, there are several rice fields. For photographers these rice fields offer, color and often a nice reflection as well as landscape. As you drive to the Chocolate Hills you’ll pass lots of beautiful rice field landscapes. In addition, you could make a special trip to the Cambuyo rice fields. 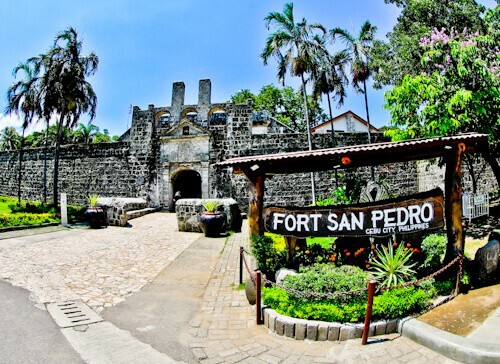 It’s possible to make a day trip to Cebu City from Bohol. 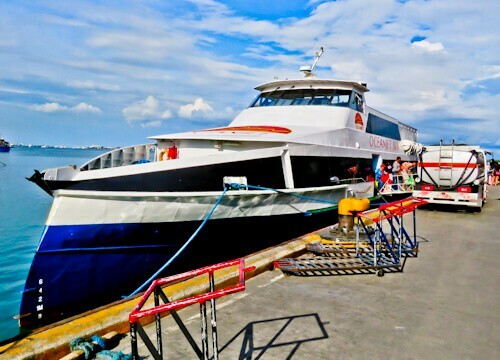 Additionally, the ferry port in Cebu is located within walking distance of most Cebu City points of interest. Cebu has been a Spanish as well as an American colony. For this reason you’ll find Spanish and American colonial buildings. In fact, the Spanish built a huge fort which still stands today. Another noteworthy point of interest in Cebu is the Magellan’s Cross which was brought by Portuguese and Spanish in the 16th century. Read about things to do in Cebu City. 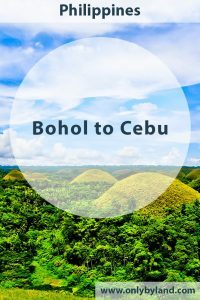 It’s easy to travel from Bohol to Cebu City. First of all you must reach the Bohol ferry terminal in Tagbilaran. Once at the terminal you can buy your ticket for the next ferry. Ferries leave every hour and are operated by different companies. The cost of a one way ticket is 500 pesos. For this price you get a designated seat in an air conditioned room. In addition, they play a movie for example, Thor Ragnarok was playing when I made the crossing. Once the ferry arrives in Cebu City, walk towards the city and ignore anyone offering a taxi. There’s an official white taxi rank 100 meters from the port if you do require a taxi. Great article! Bohol is one my bucket list. Now I know where to start from. See you soon Bohol!